There’s a definite process for reaching $1,000,000.00 in sales. It’s not easy to come by, it’s not easy to do. More so, it’s not what’s most important! However, once you master these 9 steps, you’ll start making profits that you never even knew were possible. The 9 Step process you’ll read today is exactly what I did to build, and then sell my highly profitable painting company, and you can too! This is your chance to own DYB Coach’s treasured collection of business growth courses. Join over 150 other painting contractors, and other business owners and access our proven marketing trainings, checklists, templates, and more for only $37 monthly membership. Learn more now. This resource is designed for those unfamiliar with DYB Coach — and for those DYB Members that want a refresher course on the foundational principles of the DYB SYSTEM. It’s also a roadmap of sorts. You see — all painting contractors, contractors, and business owners, are at various levels of STUCK. There’s just so much to learn. From a one man show, to a company with multiple crews — we are all looking to get better at what we do — always looking for an edge. It’s our defining characteristic. This page is here to help you master this contracting business. It’s the same system I used to quintuple (5X) my painting company, Burnett Painting, inside of 3 years. Unpacked and laid out for you step by step, in checklist form, located in the DYB Cafe. We call it the DYB SYSTEM. This is the stuff they don’t teach in business school or even high school… or so I’ve heard, being I didn’t graduate myself. The following image outlines the DYB SYSTEM. If you plan to execute this plan, you’ll need to reference it often. When you’re learning new tactics like capturing video testimonials, closing on the spot, owning the first page of Google, you’ll need to constantly remind yourself of the DYB process. Otherwise, you’re wasting time and money. This is a warning: There is little profit in understanding, for example, Ads the don’t look like Anything But Ads ( ABA’s ), or owning the first page of Google in and of itself. There is enormous profit in understanding how to apply these high value, lead generating, business growing strategies to the DYB SYSTEM. Lean into this article and pay close attention — we’re about to reveal the exact process we used to build and then be able to sell Burnett Painting. When you read that, who came to mind for you? “Exterior home repaints of homes no older than 15 years, of retirees, with stucco siding ranging from 2,000 – 4,000 square feet, in gated & golfing communities, within 10 miles of XYZ city/neighborhood. Now, we have a 1,000X better chance of some visuals coming to mind and generating a whole fleet of referrals! But how can we absolutely know who our Target Market should be? Do you like to work for difficult people? Of course not. If we had our choice, we would only work for awesome people, right?! We classify them; A, B, C, and D.
A clients are Awesome! They fully respect the value of our services and do not ask for a discount. B clients are good people, but they just have to have a little discount, or added value into the job to feel like they got an even better deal. We don’t ever advise giving discounts. Doing so only discredits the value you are bringing to the table. Instead, offer additional value, if needed. As a simple example, if you are painting the walls of a bedroom, and the B customers ask for a discount, politely decline, but then offer to include painting his ceiling or baseboard, if he signs today. If you are going to include additional value, make sure you trade it for the sale. C clients, while polite, only care about the price, and will work hard to negotiate it down for as long as it takes. So if that was a classic example of a C client, how could it get any worse? Well, I am glad (and sad at the same time) you asked. D clients, will negotiate like a C Client, but are not polite about it, or many times seem polite during the negotiations, then after you agree to drop your price and do the job, their true colors come out and they are some of the most unreasonable people to ever have the displeasure to work for. From my experience, generally speaking, not all, but most General Contractors/Builders (Dirtbag Builders) and Trial Lawyers. Only service, and stay T.O.M (Top of Mind) with A & B Clients. This one seems obvious, right? Well, you would be very surprised just how many companies continue to take on types of jobs, or types that they are just not best set up or suited for. For us, one was high-rise condo buildings greater than 3 stories. We just weren’t set up properly to execute them profitably. Could we have changed our processes and made that niche profitable for us? Absolutely. But we didn’t because we made a decision to focus on those exterior stucco homes I mentioned earlier. By process, we are referring to the admin side of the project as well as technical. Will this project be easy to set up and to service? Will this project be easy to execute? Will the job be easy to close out and settle up? If the answer is a “yes” for all three questions, only then do we qualify the 3RD P.
THE 3P EXERCISE: YOUR TURN. We have gone through this exercise with many of our members and again at our DYB Seminars. Here is the worksheet we use that you can download. List the last 10 jobs that you have completed. Put a check by each one that was awesome to work for. Add a check if you made your profit margin that you were shooting for. Add a check if the process was easily executed from sale to completion. How many of them have all 3 checked off? CIRCLE the ones that have 3 checkmarks. You just discovered your Target Market! You did the exercise, right? The first time we ran through this with our DYB Members, they have on average 3-4 with all 3 checked off. If that’s what you found, don’t feel bad; that’s average. We go through this again with our DYB Members 6 months later, and on average, they have 8 with all 3 checked off, and you can too, if you do the exercise. This might shock you, but SEO is not that complicated. Well, not if you leverage the Pareto Principle that is, better known as the 80/20 rule. Because I have “OCG” (Obsessive Compulsive Gift– messy people call it a disorder), I love to not just organize, but track and measure. I’m talking miles, and miles of spread sheets. And you get to benefit from one of my OCG tracking and measuring with the 80/20 of SEO. If you just focus on these 3 elements, you, too, will Own the First Page of Google! …with the 5 orange stars, so that you will not only rank in the “3 Pack”, but stand out like the above screen shot of Burnett Painting. The key to getting 5 Google Reviews, is to send the Google Review link to your customers who already have Gmail addresses! Here are 2 screenshots from search results page for “exterior painting Venice Fl. Notice how we are ranked #1 organic, which is right after the paid Ad spots? Also notice how the rest of the first page is LOADED with paid lead services! When other companies pay for ads, not you because you know better pay them, they are actually funding their SEO to knock you off the first page! Plus, these racketeers typically attract bargain hunters and many of them are unreasonable. Or as we classify them, C & D prospects, from our A-D scale. Paying these racketeers is using the Pareto Principle – 80/20, against yourself. If you are currently caught up in one of these rackets, I strongly suggest you implement the strategies we are laying out here ASAP, and then slowly wean yourself off of these thugs. Fair warning, the Racketeers will keep calling and threatening you about all the problems you will supposedly have if you don’t pay them for their “protection” services of keeping you ranked so they can keep sending you crappy leads. Which is writing just one 300 to 500 word blog post a week. So easy, in fact, Ron Ramsden, who didn’t even have a website shortly before signing up for 1-1 Coaching, now has well over 100 blog articles in just over a year’s time. He receives multiple bookings on his website every week. and is now a certified DYB Coach, helping other painting contractors do the same. We take these NAPs, not after lunch, but to all of the online directories. Now, unless you are just starting out, like we were when we started all over back in Florida in early 2006, I strongly suggest you outsource this step as the ROI is not worth your time to look all of these up yourself. I know what you’re thinking, “Steve, seriously, how do we pre-close qualified prospects? The very first thing we do is set up the Home page properly, and we do this by setting the stage with the most important element on your whole site and that is the Header Image. Your header image should give all visitors to your site an instant idea of –not just the type of job you service, but the experience they can expect. Because, really, it all comes down to your clients’ experience. They already expect you will provide a good service. What they are most concerned about, if they award you the project, is if you will do everything you promised you would do and will it be a great experience for them. We answer this with the static header image of a beautiful job that perfectly represents your target market. But how will they know ahead of time that they will receive a remarkable experience? So, the panel directly following the Header Image must have testimonials. But not just written testimonials. For your DYB Website Conversion Funnel to Pre-sell your prospect, you must have video testimonials. To help you, I made a free checklist you can download and even add your own logo to, then print out and take with you and or hand out to your team here: Free Testimonial Checklist Download. We have a whole course in the DYB Cafe on capturing video testimonials and many of our DYB Members are racking them up! This is another opportunity to show a ton of social proof, by displaying on the next panel, a map with pins from all of the jobs you have completed. This gives them another instant visual and will pre-sell many of your qualified prospects! The icing on the cake is the last panel. The CTA or Call To Action. The simple Booking Calendar integrated right into your website. Clients love the fact that they didn’t have to go through the hassle to call you, so much in fact, that many of them won’t even call another contractor, leaving you to be the only estimator! This is just the Home page, and if you only get this one thing set up properly, you will in fact have leveraged the Pareto Principle again, because 80% of them will scroll down these 4 magical panels on your home page and book you! After closing 100’s, maybe 1,000’s, of jobs on the spot, I thank every one of them, then I asked them why they chose us. Access your ‘[COURSE] How To Build Your DYB Website Conversion Funnel in DYB Cafe. Learn the exact process to build into your website – so to preclose jobs before you even arrive to the estimate! Is exactly what the DYB ABC’s Sales is… Always Be Connecting. After we decided exactly what our Target Market was using the 3P’s process, we decided to focus on Venice, Florida. We didn’t have any market share there. In fact, up until that time, we had only serviced 1 home in Venice, FL! We really needed to break into this new territory and break we did. Just like the DYB Website Conversion Funnel, I have tested and measured all of my efforts. I know exactly what got us and which strategies will get you the greatest ROI for your effort and dollars invested. BNI is the first step to breaking into any market. This is a great group that meets weekly and where the members are held accountable for passing referrals. Strong groups are around 40 members. Some get as high as 60 and 70 which is pretty amazing! Strong groups also get together for monthly socials. These tend to be at different member’s offices and are a great time. Strong groups also have Christmas parties, which are also a great time. When you join one, your first mission is to have as many one on one coffee or lunches with the members as possible. You are going to get to know these 40 business partners very well and will very likely become great friends. April and I have really great friends from our days back in the Venice, FL Tuesday morning BNI. The quicker you can get to know the members, the faster you can start referring them business and the sooner you start referring them business, the Law of Reciprocity kicks in and #DYBBOOMSHALAKALAKA! You are getting tens of thousands of dollars worth of great referrals from them as well. The relationships in BNI grow very deep and strong as they are kind of limited to the 40 or so members. Which is good, because that’s what makes it so strong. To cast a very wide net, we join and attend all of the Chamber functions. This is a great opportunity for you to greatly expand your brand awareness. Especially if you are not safe about it. We can just attend the networking breakfast, lunches, and After 5pm Events and get togethers, but that’s what average people do and DYB Members are not average. In this situation, there are 2 ways to operate in the Magic Zone. 1ST When meeting other business owners (networking) for the first time, focus solely on them. I know this sounds so simple, but it’s can be very difficult to consistently do, because we want to build our business. Here is where we trust the Law of Reciprocity to kick in and believe me, it will! What advice would you give somebody just getting into your business? Now they will ask you a question or two so, be polite and answer it, but immediately roll right into another question to keep it about them. Chances are very high that you are the only person who has ever asked them this and you have just made a very big impression! To really knock it out of the park, we follow up immediately with a handwritten note card. So immediate, in fact, that we keep them in our truck or car, complete with envelopes, a blue pen, and remarkable stamps, like Batman stamps and such. Have a goal to connect with 3 people at each event, follow this process, and you too will CRUSH IT! The 2ND way to operate in the Magic Zone, is to give Remarkable Networking Presentations – aka 60 second commercials. And by Remarkable, we don’t mean great or awesome, but that they stand out in such a way that others with Remark about them. It was such a hit that I continued to do them at all of the chamber lunches. Yep, DYB members are doing these to and also CRUSHING IT in their Target Markets and you can too! How would you like to know your town’s movers and shakers? I mean the good ones. “Good” meaning, these movers and shakers come together weekly to make their town and the world a better place. And when you get a room full of successful people, networking naturally happens. WARNING: Do not join Rotary, if you don’t have heart to serve. You must truly care about others first. But if you are here reading this on DYB, then chances are very high that you are a person who does truly care about others, so let’s continue. Rotary provided the highest level of networking, and when you get into this network, you are pretty much set. Again like, Rotary, get involved, lead with a heart to service, and you will do very well. Find one to join that speaks to your values and take action today. Some say Facebook is a waste of time because everybody is on it wasting time. And there-in lies your opportunity! To me, bars are a waste of time, but do businesses advertise about them and in them? Is it possible to advertise in a bar without getting drunk every night? And you can be on Facebook not wasting time, too, except don’t advertise. Why are people on Facebook “wasting time” anyway? To be entertained. To be engaged in something interesting to them. So be there and engage and entertain. One of the ways we did this with Burnett Painting, and the new awesome owners, Jenn & Kurt, are still doing this — is through fun contests. Like, the CPW (Capture Post Win) Contests. If one of our Trucks or HHR’s is spotted, captured in a photo, posted to FB with Burnett Painting tagged, the one posting will win a can of delicious gourmet cookies! The town loves it! If you don’t have your can of gourmet cookies set up yet, you can do a $10 give card to Starbucks, Amazon, you name it. Just keep it simple and fun. You can also run “How many gallons” contest where your town will guess how many total gallons it took to paint a project. This also gives you an opportunity to showcase some of your work. The truth is, nobody really likes ads anyway. We have tech available now that allows us to skip commercials or even binge watch a whole season of our favorite TV program. So, we started finding ways to get our name into the community. And then deeper into the community. And we did this until we became the preeminent painting company in our area for our target market, and if you follow implementing these, you can too! Now these are a really easy and fun way to provide both your community and business / networking friends tons of value. All you do is take your smart phone and a $12 tripod from Amazon or a local store and call a few of your friends. Offer to give them a quick interview to share with their community. Almost everybody I asked was all for it and very grateful. I arrive at their place of business. Set the tripod up with my phone to record. *Remember to turn airplane mode on! I send 3 questions to them ahead of time so they can be thinking about their replies. I also let them know that we only do 1 take. If we make mistakes, that’s cool and actually builds trust through transparency. So tell me about your business. What do you do? This last one is supposed to be fun. It draws your audience/community closer to you and the interviewer. If you’re looking for a great mechanic, you might be interested in this Community Spotlight interview I just recorded. I email the YouTube video to the person interviewed to share it with their network, also. Then we upload the raw video file directly to Facebook. We do not post the YouTube link in Facebook, because Facebook considers YouTube a competitor and will not give you much algorithm or exposure in others feeds. We also do not add it to our website, because our DYB Website Conversion Funnel is specifically designed for one purpose and one purpose alone, to pre-sell your target market before they book you and to deter those who are not your target market. I guess that’s technically 2 functions, but you get the idea. Who do you think just might be his favorite painting company? Another one of our powerful ABA’s are handing out the delicious Gourmet Cookies in our very own branded paint can! Access your ‘[COURSE] Gourmet Cookie Cans. Learn this sweet process to be the talk of the town! Many of them will be pre-sold “…Without Making A Sale,” but not all. While each step is very important, the 2 most powerful steps or the 80/20 of the DYB Sales Process are the Prequalifying and Providing Proposals on the Spot. Prequalifying is so important, yet the vast majority or painting contractors do not distinguish one prospect from another. Therefore, they find themselves driving all over town or from town to town, trying to get as many estimates in as they can, only to be frustrated and burnt out from the lack of bids won. 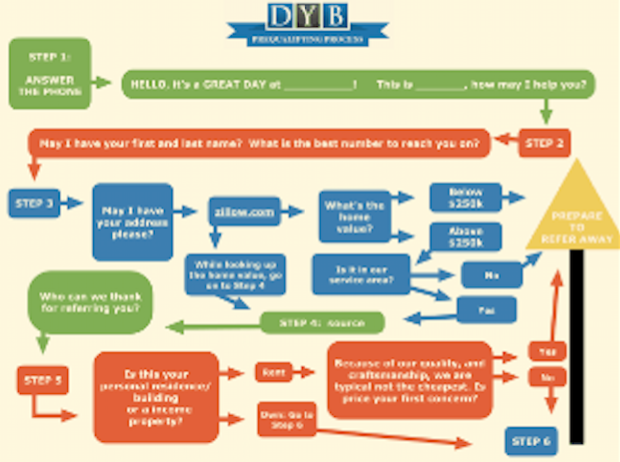 You can download our DYB Prequalifying Process for free right here. The second most powerful step is Providing Proposals on the Spot. One of our DYB members, Paul Schmidt, took his close ratio from low 30’s up to 75%, in large part to providing proposals on the spot! Paul knows and can track his exact close ratio because he uses a CRM called Pipeline Deals, which we walk you through in an online training program we created called The 30 Hour Work Week. Here are a 3 free videos from the 30 Hour Work Week program, here. This gave me time to teach my son to swim and also to write my book. If you would like a copy, just pay towards shipping, $6.95, and I’ll give it to you for free here. One of the biggest things keeping guys from providing proposals on the spot, is the confidence that their price is solid. Most contractors look at a job and guess how long it’s going to take them. By estimating this way, they lack the confidence to present on the spot. Let’s face it, they don’t know their numbers and won’t be confident until they do. Then they are really in trouble when it comes to negotiating with the prospect. Don’t worry, if this is you – we can help you! To help you to know exactly what your labor rate should be to the exact penny, including your overhead and the profit you must make to be successful, we have an Instant Labor Rate spreadsheet you can get here for FREE. A 3rd step I’ll touch on briefly here is Following Up. You have already done all the work to get the lead, drive out and measure the project, write up and present the proposal. Now you must follow up! If I had to guess, more than 90/100 contractors do not follow up. 1ST They forget because they are not using a CRM to keep all of their opportunities top of mind. 2ND Stinking-Thinking. You have self-talk. We all do. Our greatest challenge is to control our self-talk and whip it into shape every day. When our stinking-thinking says, “Oh, they probably went with another bid”, take action and follow up anyway! Email is good, but a phone call is best. What are they going to say, “NO”? We are already at no at this point. We can’t get any more “No” than we are right now without the sale closed! So follow up and call them. About 6 months after I moved to Florida, because every contractor and his brother also drove in to help out with the relief, everything was all painted in the area. So, I had to drive 45 minutes away or more to a neighborhood that wasn’t affected by the hurricane damage and literally go door to door. If you have ever done door to door sales, then you know how tough it is. To help, I collected letters from everybody I helped through the hurricane and compiled a binder, but what I noticed was nobody was reading it. And that was a big problem. It’s a big problem because, they didn’t read it, then they wouldn’t have a better understanding of the value I was offering compared to the “other guy” and that left me competing on price. Competing on price is not the way to create a successful business. Not a fun way anyway. After a few years of struggling to find ways to build value into my offering, we finally captured our first video testimonial. Actually, my wife, April did. And we just ran with them, because the ROI on Video Testimonials is AWESOME! book us online from our site. they would look at it, and maybe ask a question or two. offer a deposit, and ask how soon could we start. …in large part because we had so many Video Testimonials. 3 phases of capturing Video Testimonials. Just get your first one any way you can to break the ice. Start with a Raving Fan or somebody you have done work for in your networking group. Get 3 Video Testimonials and then create a Video Testimonial page on your website. Now you are heads and tails over your competition, because they do not have any Video Testimonials and this positions you as the more valuable contractor. “Mrs. Prospect”, I truly believe we have the best team and I can prove it if you are interested. Say, “Now you would agree that most people are not comfortable speaking on video right?” They almost always agree. Offer to let them watch any of them. To help you get started, I have my Video Testimonial Checklist as a free download for you that you can put your own logo on. The Best Time To Ask For The Testimonial – There is a critical moment when your customers are most excited about you – find out the right time to ask for the testimonial. The 3 Simple Questions to ask that make even the most boring people light up and give a glowing review. … and you, too, will Double Your Business Without Making A Sale. In 1963, 35-year-old Joe walked into a Detroit car dealership and begged a skeptical manager for a job as a salesman. He needed to get groceries for his family. So he gave him an office upstairs, with a phone, and a phone book, because they didn’t want him taking any sales away from the salesmen on the showroom floor. Well, he sold a car. By the second month, he was so good. Some of the other salesmen complained and got him fired! His next job was at Merollis Chevrolet in East Pointe, Michigan, which he held until his retirement in 1977, the year I was born. There, he set consecutive sales records over a twelve-year period, selling 6 retail cars a day when the industry average was 6 a month! Having sold 13,001 cars at a Chevrolet dealership between 1963 and 1978, Girard has been recognized by the Guinness Book of World Records as the world’s greatest salesman. Joe Girard, would stay T.O.M. by sending every person he sold car to a card every month. Sounds expensive and complicated, right? We use Send Out Cards. And with this system, we are able to create card, upload a client list, and send it to everybody for about $1.50 a card, including postage. You have already won them over with your remarkable services, they don’t need to be resold. They just need a warm reminder that you are still here. Do not send discounts or coupons. And please, do not say “We’re never too busy for your referrals”. They know we are in business and would love a referral from them. We don’t want to insult them. Of the 3 types of cards that we send, the Entertaining cards get the best response, but make sure you mix it up. It is an MLM/Networking company, so you have to sign up under a “distributor”. If you don’t have somebody in your area, you can sign up on ours here. I know they used to, for me. When it finally clicked! Once the light finally came on, doubling my business became so much easier! I could finally step back or leave for vacation and not have to worry. I mean like a cruise, where we were out on a big boat in the middle of the ocean where there is no texting or phone calls and I was able to relax.. Without drinking! The process starts with Hiring For Character, not skill. If you were like me, for so many years I would hire skilled painters and then beat my head trying to teach them proper manners and hygiene. I mean, if I could just get them to tuck their shirt in, that would be a major accomplishment! At first I brushed it off. My self-talk said, I’m just a painting contractor, they are just painters, and we are not a large corporation with educated executives. Boy was I wrong and what a bunch of head trash that was. When we had 5 jobs going. 3 exteriors and 2 interiors. Then, at about 7am sharp, a typical SW Florida tropical like rain storm started pouring like no other! While these storms are not uncommon, they were uncommon at 7am. They don’t usually start pounding until the late afternoon after we have all gotten a good days work in. At that instant, what would have happened in the past were phone calls and text messages pouring in– informing me of ALL the problems this brought. Even interior crews would have found a reason why they couldn’t paint that Monday morning! My phone never rang. Not one call. I didn’t even receive a text. No, not one. Instead, I watched it all go down. Crew Leaders were chatting it up on our company chat. They pulled up all of the jobs we had on our Basecamp Calendar and could see instantly where the crews could be rerouted to. They called up another interior customer on the calendar and ended up rerouting all the crews to 3 interiors that Monday morning, and ordered all the necessary paint needed as well. All of this took place in about 20 – 30 minutes time, and without one phone call or text to me. I sat in amazement as I watch it all go down on our team chat! To help you get started, we have a free download of the 11 Interview Questions I used that would reveal their character to me. Almost without them knowing, they were letting me know who they truly were before I hired them. Get it here. Upon hiring them, you must show them the Above the Line Philosophy. We give our team permission to hold us accountable to “being” Above the Line, as well as agreeing to hold each other accountable. Or, #DYBBOOMSHALAKALAKA, as we say in the DYB Community. Having a company policy in place is foundational. Access your ‘[COURSE] Employee Policy Manual. Just edit accordingly, add your logo, and BOOM! You are well on your way to taking your culture to the next level! So there you are… the 9 Steps to the DYB SYSTEM.